It is nothing strange to have a movie based on a novel, a play, or even another movie, but it is not every day a huge block buster is based on a toy - as is the case with Michael Bay’s FX-laden Transformers, based on Hasbro’s Transformer Action Figures(!). The convertible robot toys changing into vehicles and aircraft also spawned a TV cartoon series, but this one takes the concept to its ultimate form. 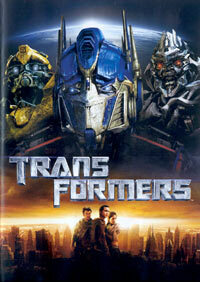 Earth becomes a battlefield when a race of robots (Decepticons) from another planet is set to eradicate the human race – but an opposing robot faction (Autobots) have been laying dormant in the guise of ordinary vehicles and appliances to jump into action, protecting man from being wiped out. One such vehicle becomes the property of a young man in the shape of his first second hand car, and he ends up becoming mankind’s last hope, together with a gang of enormous robot warriors. Far-fetched? Sure. Entertaining? Certainly. Too long at 138 minutes? By far! 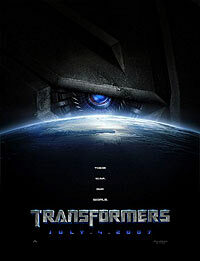 With the huge digital special effects team working overtime to create the hyper-realistic metallic barrage of imagery, Transformers is set to blow away most viewers (especially under-16s) – if you can ignore some of the totally cringe-worthy and lame script motifs and dialogue, that is.